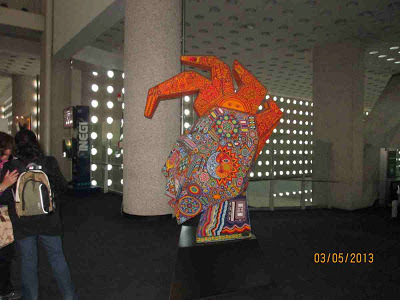 In our travels we visited a number of airports but not that many museums or art galleries. Lucky for us it seems like every airport has an art installation of some sort. Some have photography exhibits, others have sculptures and paintings. 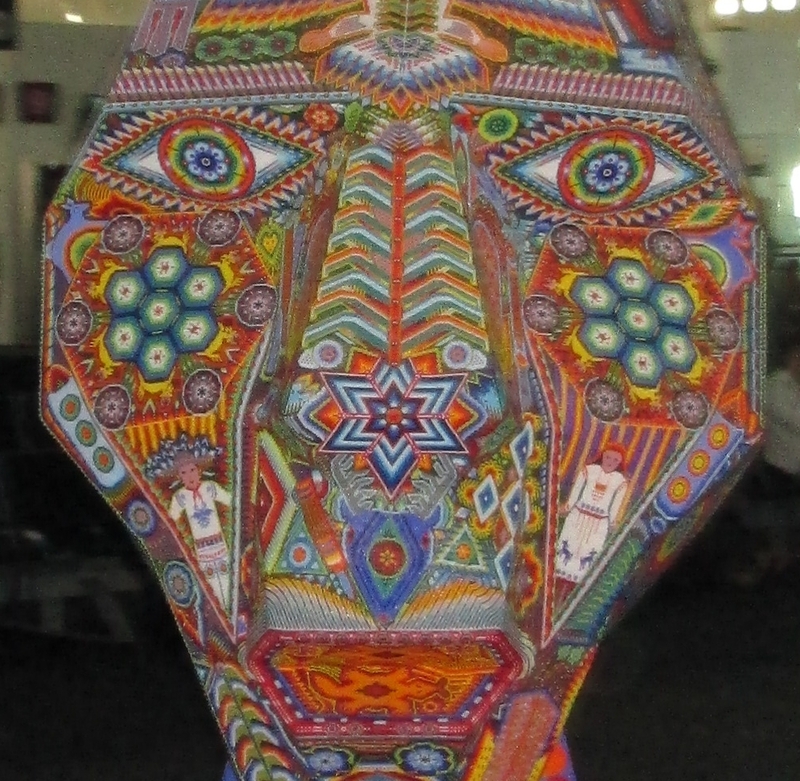 I found my favorite piece of art was the Indian Head in the Mexico City airport. 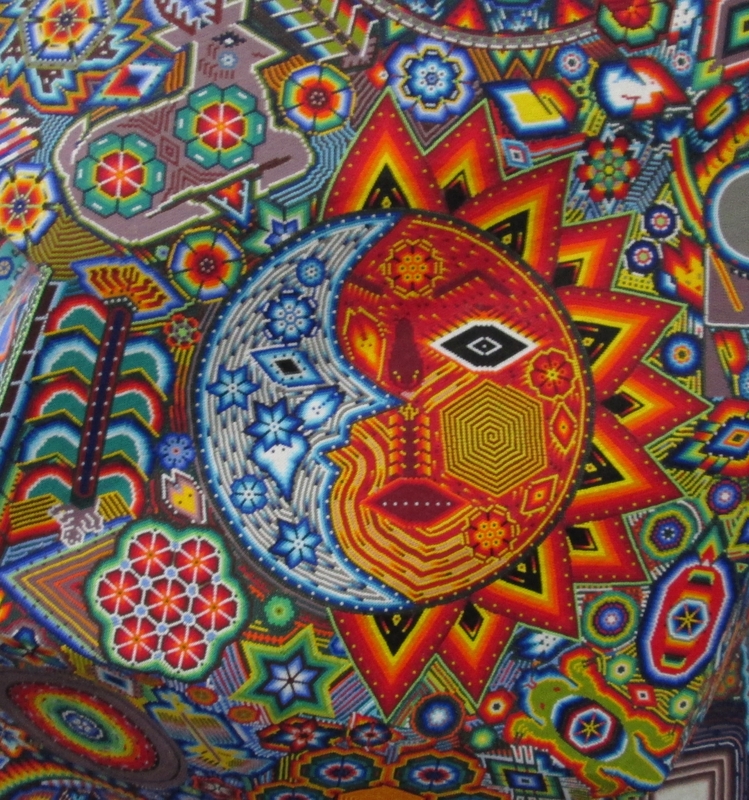 It is an example of Huichol art made from beads carefully laid out in the designs of centuries old symbols. 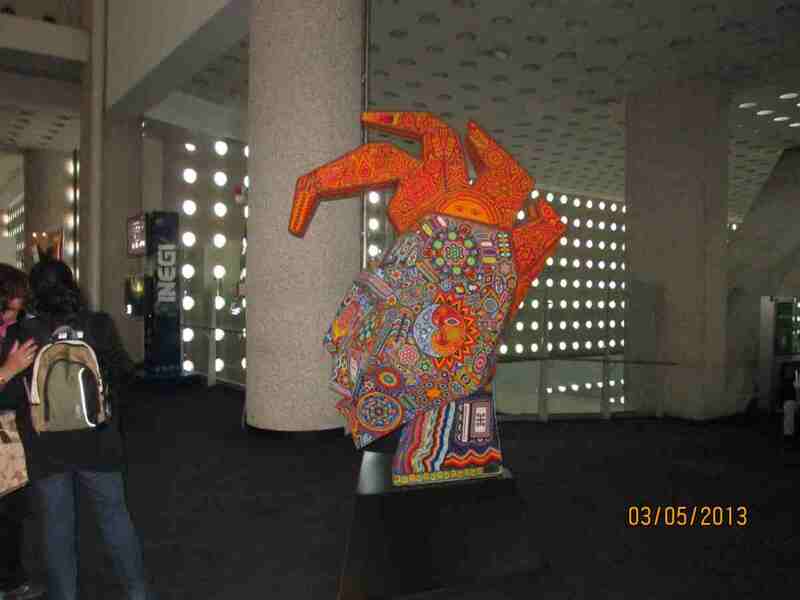 We came to recognize some of these symbols from the art we saw in and around La Cruz and Barra de Navidad in Mexico. 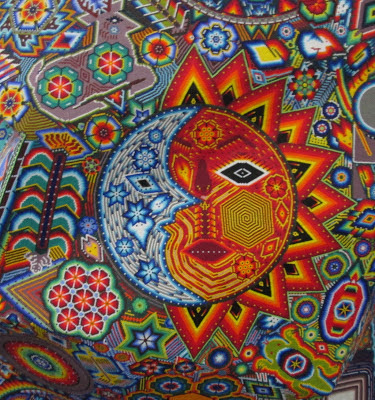 Closeup picture of the Huichol Sun-Moon symbol. The best news of late is that Ken and Kyle made it back from La Cruz last week. And all nine bags made it too. Unfortunately somewhere along the line a few things were removed from one or more of the bags. Like what? Ken's camera, a phone charger, and a few other things. A bit disappointing. At least the items were replaceable and there were only a few pictures on the camera. 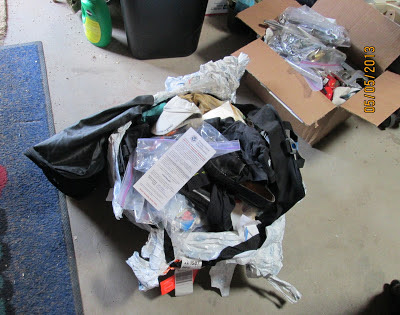 UPDATE, June 16, 2013 - We have found everything, it was just a matter of digging through all the bags. We have been back in our house a little over a week and are slowly unpacking everything. 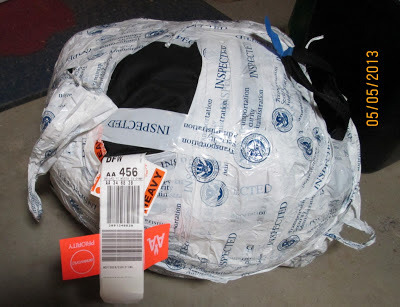 American Airlines, Alaska Airlines, and TSA get a 5 star score for bringing us and all our bags back! 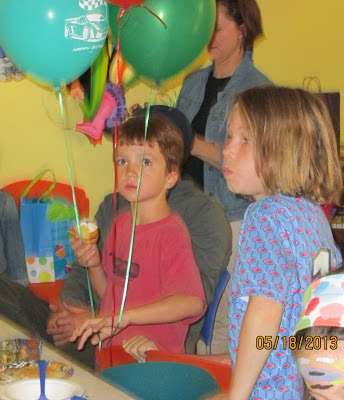 And, like last year, Kyle made it back just in time for his friend Seamus' birthday party. Kyle and Seamus got along great - as if only a week instead of a year had passed since they'd seen each other. Ken and I were pleased to get a chance to see some of our adult friends too! What is the best way to migrate all your things, carefully stowed away on a 43 ft boat, back to life on land? First, while still in the marina, we packed and packed as much of our things as we could. We paid for two taxi rides with bags from the marina to the condo we have rented for the month. 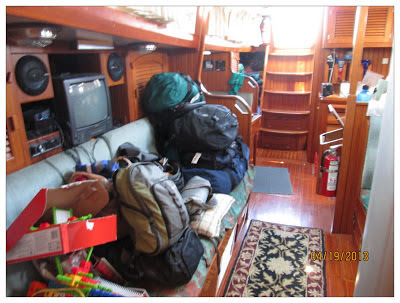 Then over about 10 days we visited Sea Biscuit in the La Cruz shipyard and packed and carried bag after bag. 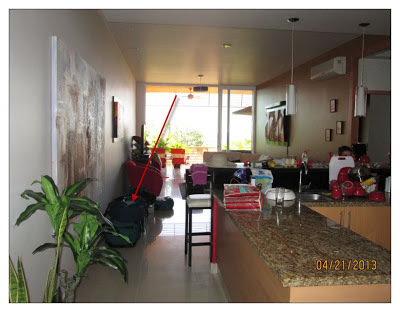 The bags would gain weight exponentially as we carried them up the moderate hill to the condo. 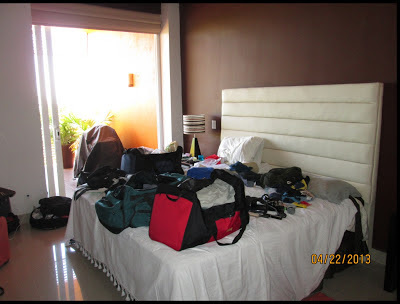 Ken and I explored many options for getting our things back to NM - ranging from storing everything in Puerto Vallarta and returning within a year to fetch it, to renting a minivan in Mexico and then changing to a second rental minivan at the border, to flying with it all. After much consideration we decided flying is the way we will move everything back. I was allowed three checked bags, Ken and Kyle will take five or six checked bags each (they are flying on Alaska Airlines). I was lucky enough to line up a job interview and have returned to New Mexico before Ken and Kyle. I flew on American with frequent flyer miles and was allowed three checked bags each weighing 70 lbs or less. We chose to bring the weight up to just under 70 lbs on each bag. This was a test of American Airlines' baggage handling abilities. All three bags made it fine to Dallas, but somewhere between Dallas and Albuquerque the inexpensive duffle bag had a blow out. I bought the bag hoping it could make this one trip and amazingly enough, it did make it, with a little help. Two of my bags, one sustained injuries. 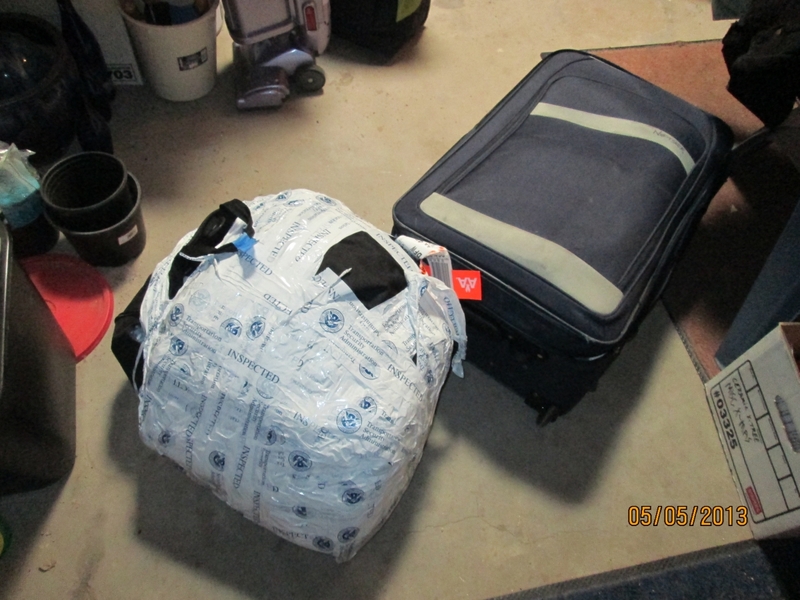 Completely encased in TSA inspection tape. After the zipper blew out, TSA did an excellent job wrapping up my bag and keeping anything from being lost. 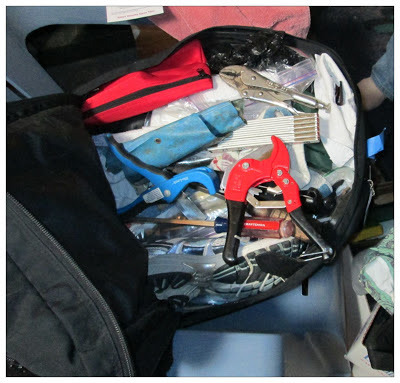 The bag was packed to capacity and weighted down with plenty of tools - no wonder it failed. Now we just hope all of Ken and Kyle's bags make the trip when they fly back at the end of May from La Cruz/Puerto Vallarta. And to end - I have to say, it is great to be back in New Mexico! 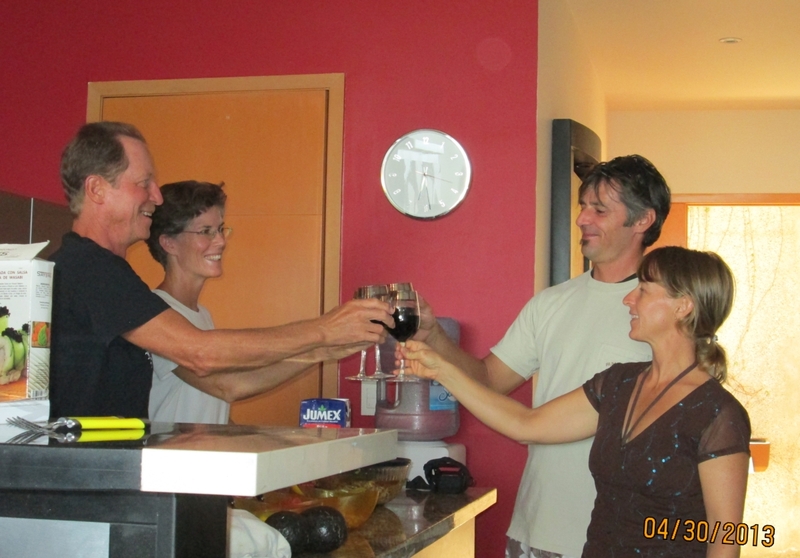 In one short month in La Cruz, Sea Biscuit has gone from belonging to us to now belonging to Tom and Chris from Vancouver, WA. While the survey was completed last week, it took a few more days to finish all the paperwork, go to the US consulate in Nuevo Vallarta to have the bill of sale notarized, and send it up to Washington state. Yesterday, on Tuesday April 30th, 2013, the closing took place. 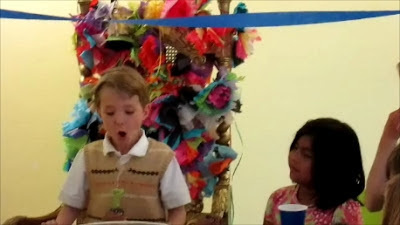 Last night we had our friends Merle and Allison and their two boys, Shandro and Matero from Kenta Anae over to help us celebrate with fish tacos for dinner. Whew! Somehow the stars must have been aligned perfectly to allow the process of selling Sea Biscuit to go so smoothly.